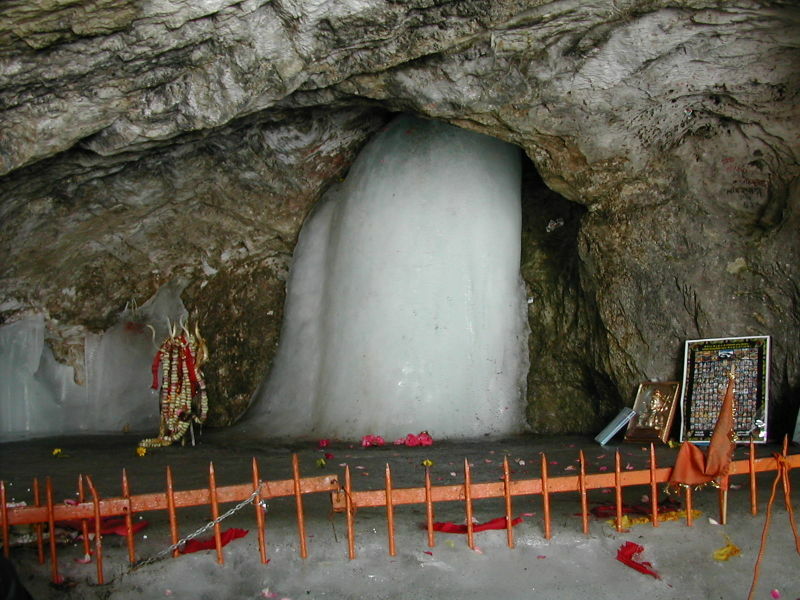 An image of The Amarnath Cave and the Lingam as it is ordinarily. In an unprecedented first, the Shiv Lingam at the holy cave of Amarnath in Kashmir has melted completely (completely in the title meant to emphasise ‘total dissolution’.. without an iota of doubt) creating a wave of disappointment in the lakh or so pilgrims gathered in Pahalgam en route Amarnath. July 1st, the first day of the pilgrimage and there was no lingam in the cave, as validated by the shrine authorities. Does this mean therefore that Lord Shiva has deserted his abode? The Shiv lingam is a natural ice stalagmite that waxes in the period between July to September in the holy months of Shravan and wanes thereafter. It is believed that Shiva Baba narrated the story of eternal life and immortality to Ma Parvati in that cave . The Shiv Lingam which formed naturally for thousands of years then grew to be known as one of the three abodes of Lord Shiva. The visual of thousands of devotees expressing anguish over a melted Lingam and evincing sentiments such as ‘ What purpose will our visit serve now?” or ” If He is not going to be there then we are as if betrayed” gets one thinking real hard as to the purpose of the yatra ( pilgrimage) in the first place. Was it to see first hand a phenomenon of nature? Does the Lingam signify the truth of a living God as Shiva is believed to be? Does the melting down mean he has fled? If Shiva lives only in the Amarnath Lingam, does that mean therefore that the hundreds of Shaivite Temples spread across the length and breadth of India are but empty shrines? What is the underlying meaning behind a pilgrimage? Well..definitely not a Nature trek! While the cause attributed to the melting has been the regular advent of helicopters in the three helipads catering to the elitist niche of pilgrims who can for a mere Rs. 5’000 get to the shrine which otherwise is an arduous trek, global warming is rumored to be another. Not a great believer in the ‘manifest’ that is ‘Aakar” but rather in the ‘unmanifest’ or ‘Nirakaar’ makes one proclaim that the presence of the Shiv Lingam has little to do with proof of Lord Shivas presence there. Subsequently the absence/ melting of the Ligam logically, is scant reason to express massive disappointment. The omnipotent, omniscient, omnipresent Almighty behooves no proof. Tangible expressions do not necessarily validate Spiritual benevolence! I have often thought pensively on the reason behind the holiest of shrines always being on the apex of a hill, mountain. The journey if arduous and long, intensifies the purpose, magnifies the longing and purifies ones intention. So much so that eventually, the Self has been elevated to a degree of cleansing that makes for a receptive medium.. If the insides are full of hatred, envy, anger, despair, ire, there is little that can be received. Only an empty receptacle can be replenished with blessings and energy. The Journey therefore is meant to be slow, determined and resolute, painstaking as if to test the mental and emotional strength of the pilgrim as also to scale his faith and belief! I read this in utter astonishment. It as if condoned the above, if one cared enough to read the underlying meaning , as one ought to read scriptures. In preparation to that He left His Nandi ( The Bull which He used to ride ) at Pahalgam (Bail gaon) . At Chandanwari He released Moon from his hairs (Jataon). At the banks of Lake Sheshnag He released the snakes . He decided to leave his Son Ganesha at Mahagunas Parvat (Mahaganesh Hill ) . At Panjtarni, Shivji left the Five Elements behind (Earth , Water, Air , Fire and Sky) which make living being . He is the Lord of these elements. It is believed that as a symbol of sacrificing the earthly world , Shivaji and Maa Parvati had Tandav Dance . After leaving behind all these, Bhole Shankar enters the Holy Amarnath Cave along with Parvati Maa . Is the melting therefore a subtle manner of letting us know that Lord Shiva would rather have his pilgrims on foot or atleast try to be there with the aid of their own physical capacity rather than adopting a short cut route via helicopters?..Notice that He discarded Nandi the bull , (His mode of transport), The moon from his hairs and snakes, (bodily decorations, adornments, indicating austere clothing) his son Ganesha, (indicating earthly connections or emotional bonds, and finally all proof of bonds) That one would think is the mental preparation needed for a purposeful pilgrimage. If only the legends of the Gods were imbibed devoid of blind faith and scrutinised for deeper hidden truths they embodied! Finally, knowledge of the Self through whatever means suited is the purpose not just of spirituality but also of ones birth. Bhole nath or the eternal life energy within us has never been disconnected to have to find Him atop moutains. But reaching the apex of personal purification is the only roadblock which keeps Him from us. LOl..At least you were honest. My bad perhaps..The point is that there have different levels through which I have dealt with this ostensibly material/physical phenomenon. Can you tell me what it is that you have not understood. Will a re-read help? Or maybe you tell me what does the melting of the lingam mean to you. I am a keen follower of Advaitism or Non Dualism which is what you are referring to I think. For most the tangible becomes the rope by which they go higher. They forget to go beyond live without the help of the obvious, in this case the Lingam. I liked the interpretation of Shiv jis journey, and his discarding the non essentials. Novel, I must say…. have not heard of it before. Undertaking a pilgrimage with correct mindset is the most crucial aspect of the journey. @ Laxmi..Thanks.. Im glad it touched a chord..Instant Nirvana ..oh yeah>>so right. There are no shortcuts here. Diving deep within and recovering lost pearls is no easy task. Really thought provoking..Thanks for the good read. Greetings. I would not dispute that global climate change is affecting the planet, however, I suggest that is not necessarily the case with the melted lingam at Amarnath cave. My wife and I trekked to Amarnath cave on the pilgrimage in late July or early August of 1974, along with an estimated 17,000 pilgrims. When we reached the cave there was no ice. The hike was indeed arduous and fulfilling in many ways. For me it was all about the journey and being in the moment. There were no helicopters around at that time. We observed a few individuals being borne up the mountain to the cave on palanquins. I enjoyed the website and thoughtful comments. I can still see Amarnath Cave in my mind’s eye some 37 years later. It would have been nice to see the ice on the full moon, but I am not disappointed. Mitnadev.. I think you have probably gauged the essence of any pilgrimage. It is more the journey within oneself to that state of higher consciousness to feel Him who is always near but hidden. The Amarnath shrine, although legendary in its power to evoke divinity, the journey or pilgrimage also needs to be undertaken with a view to raise the inner self to the extent that he can be welcomed within, with or without the Lingam in full vision. @ Laxmi..Great link.. Thanks. Actually my questions were more rhetoric than anything else, meant to question the legitimacy of the pilgrims’ disappointments. Like stated earlier the Niraakaar fascinates me, being a keen student of Lord Buddhas Vippassana system of meditation. Yes Gloal warming is creating havoc in unheard of ways already. The astounding part to do with this Lingam was that on the 20th of June when they beamed an image of it on the electronic media, it was shown as a massive one, bigger and well formed than the previous years. Within a matter of 10 days it just fizzles out into a mound of water is what is quite surprising. The reason attributed was that those pilgrims who wished to visit here ahead of the others, via helicopter had begun coming in hordes. The helipads three in number, coupled with global warming which perhaps accelerated the melting and final dissipation. Your link to do with the new temple is intriguing. Devotion paves paths in hitherto uncharted territories. But Bholenath is present in the cave as well.. perhaps grim over the grimness of Mans misdeeds. Anonymous.. I have read Swami Ramas book. Kaveetaji , you should read the biography of the founder of the institution in Hawaii. Please go thru the web site http://www.gurudeva.org in detail. There are books which are great and you will know the meaning of Lord Shiva , Ganesha and Lord Kartik. Merging with Siva, Dancing with Siva , Loving Ganesha bks are all available online in the publication section. The founders biography is one all must read. Shivji ki Leela hai apaar. I agree. I saw a report yesterday where army officers without care or concern had jumped over the barricades around the Shiva Lingam, and in numbers…this was obviously shot prior to the melting and perhaps accelerated it. They then proceeded to pose for photographs standing close to the Lingam, with their arms almost around it, saved for posterity, showing off, as if on a trip to the zoo. So was this the purpose of their visit, a snap that would rid them of their sins? It was ridiculous. And to think that this was the army who were themselves indulging in such irresponsible behaviour! Yes I have read a little and I will definitely go through the rest of the pages on the link in detail. Global warming is taking on monstrous proportions. You seem to be much informed on it. Would you like to do a post on it which I could post here on Sachiniti, attributed to you? It would be nice. @Ashok..I have read a few.. will do so again..Thanks. @Gajanan ji..Absolutely no problems. Whenever you are comfortable. on global warming – http://www.liveearth.org/ series of concerts around the world on 07-07-07. Thanks Guys Jidda and Laxmi..
Jidda that was a great link. On 6th night I will post a blog here with the link to Live Earth, and you as sender.. and the links that Laxmi has posted.. If you guys want to write some stuff on it send it to me I will post it along with these details. WE need to get upbeat about this crisis and motivate/ educate as many as we possibly can. please visit this link, i mentioned this on “VOTE FOR TAJ ” post … since there(taj post) the comments were churning out in large numbers i thought my comment might go unnoticed , sorry for posting the same comment twice. Yes, I do know of this controversy. The point however is that either way Taj is our heritage structure unparallelled in its beauty form and perfection.So voting becomes all the more incumbent..dont you think? Whether it was Shah Jehan or not..if it promotes love, it ought to be Universally lauded. Lets get out of these man made prejudices,, they bind us. Lets taste freedom in its truest manner. The Shiv Lingam has melted on the first day of the Amarnath Yatra itself.Unprecedented. what you have said in the last stanza of the things given is exactly correct .. man who gives all his worldly emotions and bonds and pleasures truly … is the one who can be free in body and soul to get the utmost energy and divine blessings could be attained …….. Learned a lot ………!!!!!!!!! !..Thanks for all who have immensely taken part on this and giving some valuabel links……. Very nicely written Kaveeta, logical and aware. This certainly provoked a lot of thoughts in my mind, albeit radical (as I am already) I like this line you wrote “I have often thought pensively on the reason behind the holiest of shrines always being on the apex of a hill, mountain.” – To this question, I might suggest looking into symbolism of concepts and penances (available aplenty in Puranas, mytho stories etc) – Since the area of God is so high, its alluding to the ascent an ordinary man/woman has to make in order to relish the joy of being with the divine (god or Atman), nowadays more prominently “sold” as pilgrimage….and to the point, my personal view is that this is clearly god’s way to say “Gimme sometime alone, please, for once! !” if he so chose to reside in those torrid zones! And we dont leave him alone even there….so he decided to take a break and go else where (the melting)….sincerely its just my lamentation about the gross misinterpretation of symbolism, faith and devotion in many Hindus, including myself, that we resort to find God only outside of ourselves, regarding the treacherous journeys, harsh climates as a “test” of our “will and faith” rather than acknowledging that we are probably better off in using such resolve to contemplate our self-conscious. S.Rajesh and Venkat ..thanks a ton. your “my personal view is that this is clearly god’s way to say “Gimme sometime alone, please, for once! !”..certainly brought a smile to my face. You have struck upon various issues really ..exactly as I would have liked it while writing this piece. Te discussion about non duality or Dvaita Advaita is as old as the hills and perhaps will continue to the end of time. I guess some queries are meant never to be answered for the search to perpetuate timelessly. I find myself agreeing with you totally when you lament over the pursuance of finding God outside ourselves..since I am a keen Vippassana student, the meditation technique which finally led to Buddhas enlightenment and which makes us the sole creators of our spiritual destiny, denying the hand of god sitting high up in ‘harsh climates’. Paradoxically, like most humans however, I disagree when the Dvaita student in me raises its head and the faith and “Bhakti’ deeply ingrained theories strike out. I find myself precariously swinging between both these worlds, equally an adherent , passionately so of their guidelines. If faith be the cornerstone of spiritual progress, which experience shows me to be true, then I am well on my way. Simultaneously, if disregard for rituals and symbolic actions be the test of a true Advaita meditator, I may find myself in that category as well. If you recall , therefore I began by asking ‘do we consider ourselves deuteragonists’ in that sense. It is merely another way to get deep into our self conscious for those to who tangible assimilation of religious ideals is a must. All paths lead to the sun if interpreted metaphorically will elucidate my point. The sum total or bottom line remains an elevated and heightened sense of spiritual awareness.. As Vivekananda said’ You can be born in a church but dont die in one”..meaning progress is the only yardstick of inner growth. Human life has just this one goal..none other. As i read from the internet, only two well known ‘nath’ sampradays are known in world right now: Adi-nath and Nandinatha Sampradaya. Adinath is the linage of the great Matsyendranath and Gorakhnath ji. the second last nath in this chain, initiated a ‘white’ who near the time of his death, declared – no more initiation of Indians!!! and only whites! same with Nandinath linage, the reins has been handed over to a white who has settled in Hawaii and 1)is not accessible to ordinary hindus. 2)whites get the privilege and preference for doing prayer, knowledge etc. over Indians. Those who know Shiv-Puran, plz. read the story of durgam-danav (killed by Devi Durga). the great lord SadaShiv has also said that knowledge should be given to the ‘right’-person only. the real knowledge and essence of hindu religion is being silently stolen by west, and here we are discussing what? ‘Real knowledge ‘ can never be stolen!!!!!!!!!!!!!!!!!!!!! If you pledge by Mahadeva then understand first that whatever happens is His WILL. I have tried to find pictures of both before and after, does anyone know where a few good ones are located on the web? Many of us ignore facts and suppress our own inquisitiveness, suppress our own understanding deep down in our hearts to avoid strife, tension between peers etc…Confusing? What is the meaning of shiv ling and its shape? Some know but yet shy away from re-thinking it, some who don’t know can easily find it on the web! What is my point? People are born and are raised in a religion. Some stay, some leave. Those who shy away from their inner instincts are the ones who have more probability of staying, but still struggling to be satisfied with what their faith is all about. Those who search for the truth, prompted to respond to their inner instincts, leave their faith or stay if it really makes sense. Confusing? People of India…listen to your heart deep down. Do you really think that these symbols signify the presence of God? You live for 70 years and you think you either become non-existent or come as another being? Do you really believe deep down that this is your fate? I have struggled with my faith in which I was born but now have found the trophy of my quest, God! Why shouldn’t I speak to everyone about it? Many of you have zeal, a zeal for the faith in which you were born. But your own heart cannot accept the things which you would like to believe, because it doesn’t exist. Your zeal without the knowledge of the truth will take you to the pits of hell where there is only darkness, anguish and suffering and you will realize that it is neither your re-incarnation nor your non-existence. I am in no way inclined to speak against you or your beliefs. I know the zeal I had for my faith in which I was born. I had no knowledge nor satisfaction of my heart until I found what I have come to believe. Confusing? Would you trade-in 70 years of zeal for wrong things, so that you follow your family tradition, so that you don’t offend your parents, so that you be blinded by your own zeal? or Rather would you look, open your eyes and listen to your heart and search for the thing that is real? Would you trade-in 70 years of decent living on earth for eternity in abyss? or Rather would you smack you brains and get to work to find the truth, so that you can spend eternity with the real God? Please India, time the deal with the pretensions and bring the facts to the table and deal with it. Let the people who are bound by spiritual darkness be released by this truth. Jesus Christ is this Truth. He is waiting for you to seek Him. Call upon Him and He will answer. Jesus saves from eternal fire (hell)!Don’t let it be too late. @tj : Do you really think Jesus Christ, Go and search the truth for yourself, he was just a normal man who happen to learn Buddhism in India from age 14 to 29 and went back to Israel and preached it to his followers on this own way which you guys now say Christianity(The Most Modified Religion of All Time). And your jesus christ, just like other normal human being like you and me, died at the age of 80 in India in Jammu and Kashmir. So go and clear your doubts and come back to the Only One Truth and the only way of Life i.e. Sanatan Dharma AKA Hinduism. Many adults in the United States are concerned about climate change, according to a poll by Rasmussen Reports. 47 per cent of respondents think global warming is a very serious problem, while 26 per cent deem it as somewhat serious. in response to badeguruji, I’d like to point out that the initiations he refers to were freely given, not “stolen”. Second, there seems to be some misunderstanding that because a couple of guruparamaparas passed to Westerners, that Indians are somehow deprived of the many other Nath guruparamparas which remain to this day in India. How could that be! If i want to visit amarnath yatra what is flight fare of this which traveles is best for this yatra.Please let me know the deatiles of this tour programe. You have deep knowledge about Amarnath have a look at this page http://www.travelchacha.com/yatra/amarnath-yatra.htm and tell what better we can add to this. The Nandninatha Sampradaya followed in Hawaii by http://www.gurudeva.org cannot be considered as a stolen one. The founder Siva Subramuniyaswami , an American was a disciple of Sage Yogaswami who lived in Sri Lanka. Sage Yogaswami lived some time with Ramana Maharishi , who sat in one place and attracted many followers Indian as well as westerners like Paul Brunton, Arthur Osbourne and Somerset Maugham who wrote the book Razor’s Edge based on Ramana MRishi. Ramana still contnues to spellbound many with his great question ” Who am I? Gurudeva.org is based on translations from Tamil and they have done a great job by clearing the misconceptions of Hinduism , Aryans , Dravidians , which was hoisted on India by British for colonising. I would not call them stealing as they have acknowledged everything to India and Santan Dharma. Many of my friends have visited this place and were recd as equal as westerners and there is no ill feeling towards if you are a Vaishana or Shaiva, for they have understood Hindu ethos well. Come to your point of westerners and Sanatan Dharma. The west even with its religions does not have a equivalent word to Gnana in their dictionary. Swami Vivekananda emphasised this very well in his collected works. Yes Gnana is not intuition , but beyond intution, something which cannot be comprehended. The best example in modern times to expalin Gnana is the genius Maths wizard Srinivass Ramanujan. Srinivasa Ramanujan;s family were worshippers of Shakti ( Nammakkal Goddess). I need not elaborate , but Ramanujan went to Cambridge and did work with Prof Hardy and Prof Littlewood. It is said , three to four times , he wrote maths continously for hrs , not knowing the difference between day and night. This made the Profs not understand what this genius is doing for hrs and that too very accurately. When asked Ramanujan replied ” Goddess Namakkal is the inspiration” Ramanujan was in trans as if in meditation. This is what Gnana is all about , which these two Prof allowed him to do and he wrote some great maths which is used in space and computer science in a big way. The Prof’s said to Ramanujan ” This is great stuff , please continue and he went on and on with his epoch making maths like a Gnana Yogi. The West and the religions will find it difficult to decipher the meaning of Gnana. Some even called it Mumnbo Jumbo or mysticism. Even now many are not able to comprehend Gnana means to go beyond frontiers. One feels that the monks in Hawaii have done a commendable job in clearing out the misconceptions of Sanatan Dharma and explain to the world that Gnana is uniquely Sanatan and it is all inclusive of Sanatan Dharma’s gift to the troubled world. Really a thought provoking article which will compel many to do a soul searching before embarking upon such a pilgrimage. I did not understand a single bit. Would have been much clearer had it been written in a simple language that milions of laymen like me can understand rather than for a handful of intellectuals. May be some day you would think like a genius and pen it down like a layman. hey baba rammohan apki sharan me hai…. jai baba sabki suno aur meri bhi suno. THOUGHT PROVOKING ARTICLE &GOOD DISCUSSIONS. GREAT READING WITH COMMENTS TOO. 62.remark=kavitha as xlent…………………………………… very good ……….really see this .